Truflex® FHP Belts are recommended for cultivators, lawn mowers, household appliances and HVAC equipment. Truflex® FHP Belts: Used on Powered cultivators, lawn mowers, household appliances and HVAC equipment. Truflex® Belts give optimum service on fractional horsepower-FHP V belt drives including back idler applications. 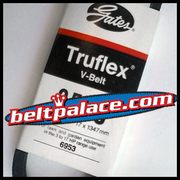 Gates Truflex® V Belts are recommended for applications such as powered cultivators, lawn mowers, electric household appliances and HVAC equipment. Construction: * Recommended for small diameter drives. * Ideal for back idler applications. * Flex-Weave® cover. * Flex-bonded tensile member. * Oil and heat resistant compound. * Static conductive (RMA). * Extremely flexible. * Smooth, quiet operation. * Economical drives. * Superior length stability. Call for additional sizes! 317-519-9020. M-F, 8AM-4PM EST. Truflex 3530 Belt. Category: FHP Low Horse-Power V-Belt. 4L530 V-Belt. FHP Light Duty V-belt. 53" (1345mm) Length, 1/2" (13mm) Wide.